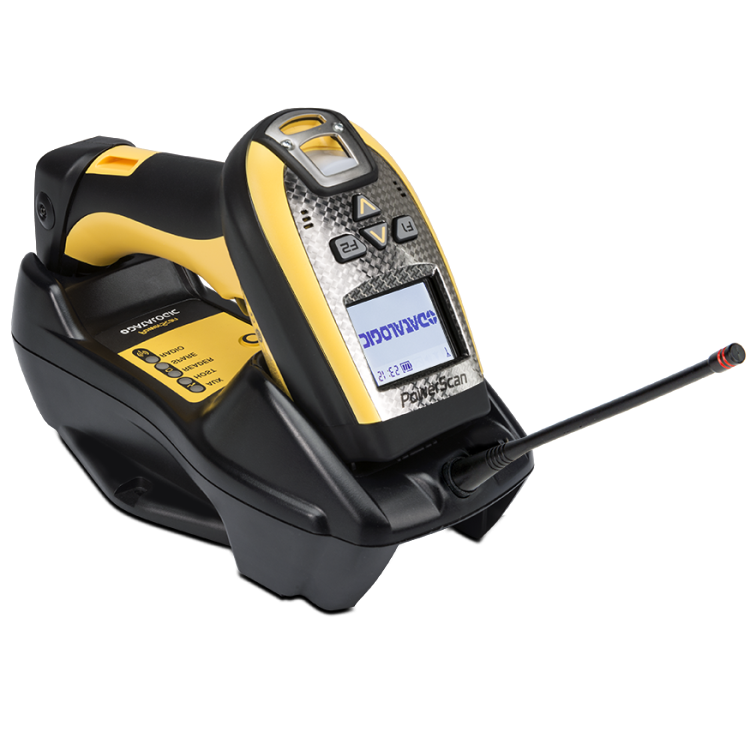 The PowerScan™ PM9500-DPM Evo reader is a cordless rugged handheld area imager specifically addressed and capable of reading codes marked with DPM applications. Direct Part Marking (DPM) is a process that allows users to imprint a bar code directly on an item instead of printing the code on a paper label. The PowerScan PM9530-DPM Evo imager includes the latest optics and software from Datalogic to make the reading of codes marked with DPM technology easy and intuitive. The typical reading distance is from contact to 4-5 cm / 1.5-1.9 in, depending on the DPM technology used, the code resolution, and the material and surface type. The scanner is also capable of reading standard bar codes printed on labels. It is based on a high density optic which allows the capture of very small, high-resolution codes in a range from near contact up to 15.0 cm / 5.9 in. The PowerScan PM9500-DPM Evo imager is equipped with Datalogic’s STAR Cordless System™ 2.0, which is available in 433 MHz or 910 MHz. Additionally, it features ‘backwards compatibility’, making it compatible with the current PowerScan STAR radio technology. The intuitive aiming system allows the highest first-pass reading rate. Additionally, the PowerScan PM9500-DPM Evo area imager uses a soft-pulsed white illumination light resulting in reduced flashes, which is very gentle on users’ eyes. Datalogic’s Motionix™ motion-sensing technology detects the natural actions of the operator to automatically switch the scanner into the desired scanning mode. The BC9180 base/charger also includes in one model two different Ethernet connections: Standard Ethernet and Industrial Ethernet protocols such as Ethernet IP and Modbus.